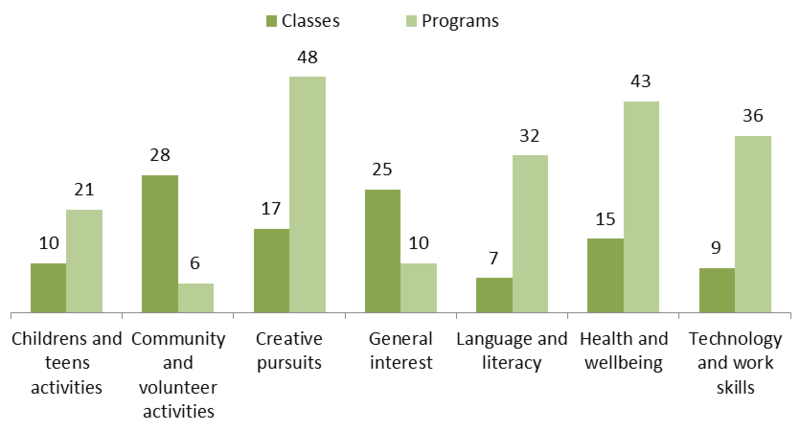 Participation in arts and culture was measured in the 2011 VicHealth Indicators Survey. Respondents were asked if they had attended arts activities or events and if they had made or created art or craft in the last three months (Figure 1). 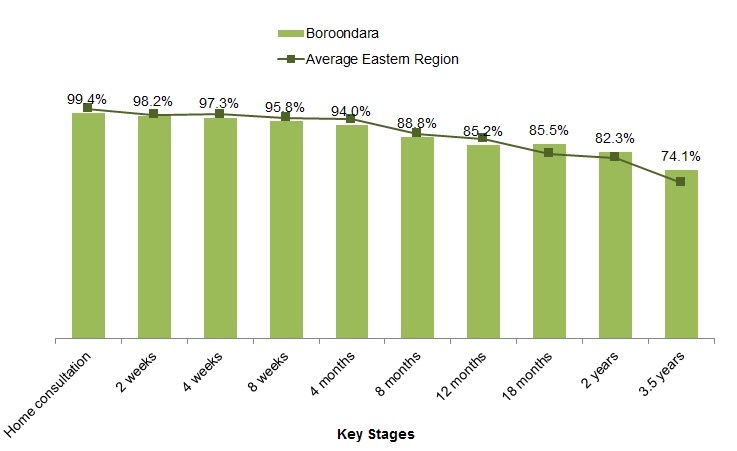 Engagement was higher in arts and crafts in Boroondara compared to Victoria for both these measures. Around 8 out of 10 Boroondara residents (82.6%) participated in at least 1 of the selected artistic and cultural activities in the previous month, compared to 70.5% in the Eastern Metropolitan Region and the Victorian average of 63.6%. Boroondara's community centres and neighbourhood houses host many local clubs and community groups and also run a range of facilitated classes and programs. Figure 2 summarises the types of classes and programs offered across all 10 sites between February and June 2015. A survey of people using neighbourhood houses and community centres in Boroondara (the Neighbourhood House Participant Survey 2013) found that the most common reasons for people using the centres were social, half the visitors to centres in the City of Boroondara said they were there to spend time with other people (50.7%), and just over 4 in 10 visitors were there to meet new people and make friends (41.0%). The full list of reasons is provided in Figure 3. In Boroondara, all age groups were not proportionally represented by the clients who responded to the Neighbourhood House Participant Survey 2013. 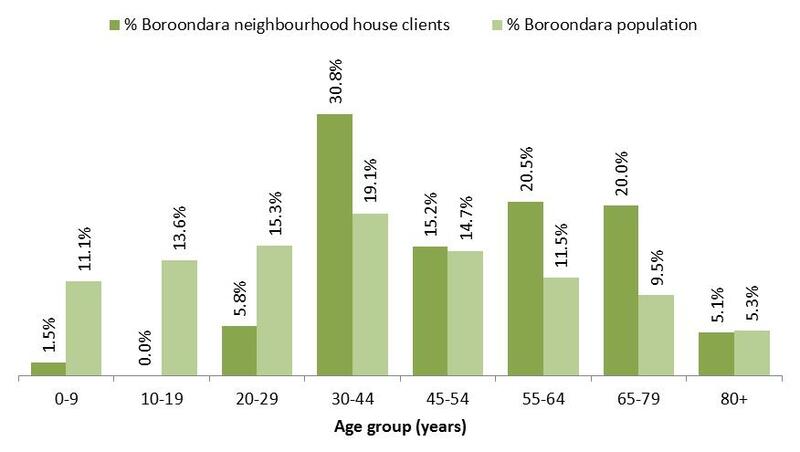 The age groups of clients over-represented compared to the City of Boroondara population were 30-44 years, 55-64 years and 65-74 years (see Figure 4). Across all age groups, more females used the centres than males with the 30-44 years age group having the biggest difference (85% of clients in this age group are female). Boroondara has 5 public libraries. In 2013-14 there were just more than 40,000 active members that made more than 1 million visits. In addition to Boroondara's 5 libraries and online library services, the City offers a home library service. The 2 main groups served are people confined to hospitals, nursing homes and special accommodation homes, and residents living at home who have limited mobility. 40 institutions reached by the Home Library Service. As of May 2015, there were 330 permanent and 88 limited liquor licences (e.g. for one-off events) held by vendors in Boroondara. Hawthorn had the most licences, including 7 late-night venues. Camberwell had the highest number of 'bring your own' (BYO) liquor licences of all suburbs. 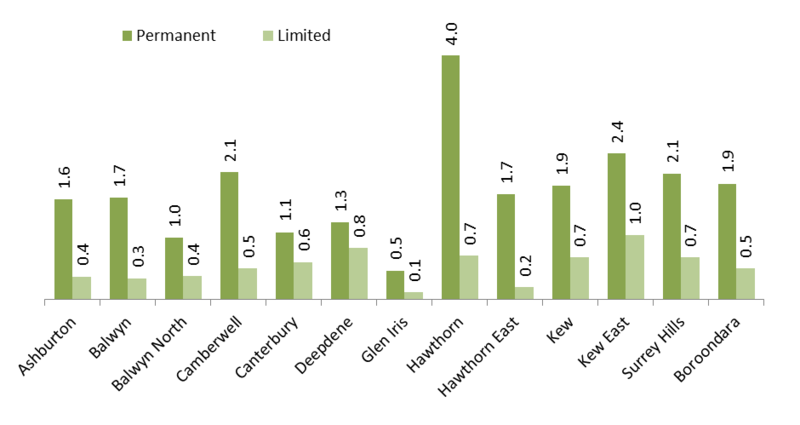 Hawthorn had the highest rate of venues with permanent licences per 1000 residents (4 per 1000 residents) and Kew East had the highest rate of limited licences per 1000 residents (1 per 1000 residents). See Figure 6 for a full list of suburbs.